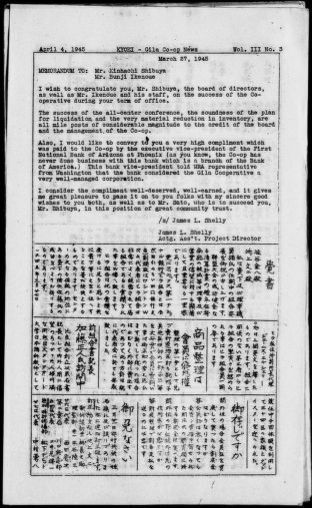 - Published for internees at the Gila River Relocation Center, Rivers, Ariz.
Gila Co-op news . [Rivers, Ariz., April 4] (Rivers, AZ), Apr. 4 1945. https://0-www.loc.gov.oasys.lib.oxy.edu/item/sn94050512/1945-04-04/ed-1/. (1945, April 4) Gila Co-op news . [Rivers, Ariz., April 4]. Retrieved from the Library of Congress, https://0-www.loc.gov.oasys.lib.oxy.edu/item/sn94050512/1945-04-04/ed-1/. Gila Co-op news . [Rivers, Ariz., April 4] (Rivers, AZ) 4 Apr. 1945. Retrieved from the Library of Congress, www.loc.gov/item/sn94050512/1945-04-04/ed-1/.